A commissioned painting makes a lovely gift. 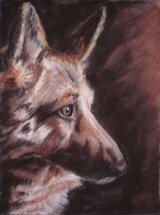 I usually paint pet portraits and landscapes/seascapes, but I'll be happy to consider other subjects, such as a special place or object/still life etc. Please contact me with high quality photograph(s) and we can discuss the details. Please contact me to discuss prices for larger pieces or in different mediums such as Pastel, Acrylic, Watercolour or Inks. Free shipping within UK. Please contact me for delivery prices to Europe and the rest of the World.